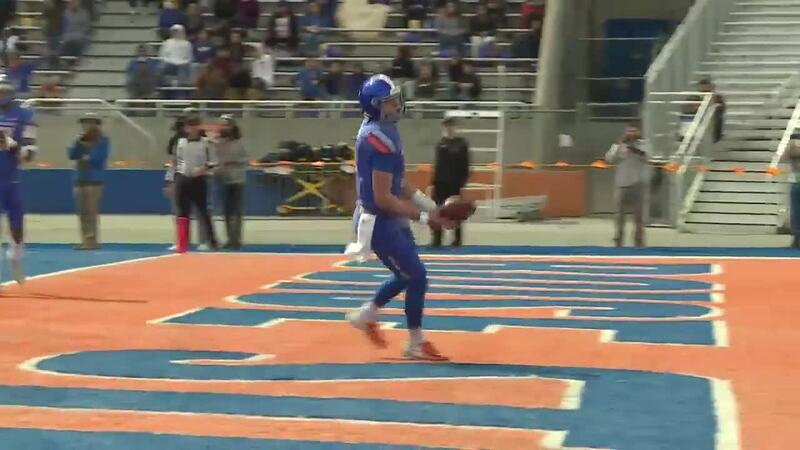 BOISE, Idaho — The Boise State Broncos ended their spring session with a scrimmage on the blue giving fans their first chance to check out the 2019 Broncos. The Broncos certainly have a lot of questions heading into the fall like who's going to play quarterback, who will replace Alexander Mattison in the backfield and how will losing defensive coordinator Andy Avalos to the University of Oregon impact the defense. However, the Broncos also return a talented group of players who look to make their own mark in 2019, Khalil Shakir a sophomore wide receiver had some big plays including a 53-yard touchdown on the first drive of the game. "It was my first game on the field since I've been out with an injury last season so it was good to get out there and play with the team," said Shakir. "It felt really good, I'm all smiles today." All four quarterbacks had their moments, senior Jalen Henderson lead a touchdown drive on his first possession, Freshman Riley Smith did as well, Zach Matlock and Hank Bachmeier also freshman played as well, Chase Cord who has the most snaps at quarterback for the Broncos did not play because of injury. It will be fun to see how it all plays out for Coach Harsin as the Broncos finished up spring ball, Boise State will travel to Florida State to take on the Seminoles in their first game this fall.